Byrd and Coats are known for their unique forms of magic. This magic duo has teamed up with Wrigley Jr. Co. to bring you one of the most unique forms of magic, BUBBLE GUM MAGIC. This download will teach you step-by-step how to perform hard hitting illusions with bubble gum. Gum Through Window - A spectator chooses a pack of gum, then multiple packs of gum are thrown at a window. The spectator's chosen gum pack penetrates the window and ends up stuck to the other side. Straight from the Factory - A spectator chooses a card from a deck and chooses a pack of gum from a sealed multi-pack. The spectator's card ends up in the un-opened, sealed pack of gum inside the sealed multi-pack. Gum Through Window Combo - A combination of Gum through Window and Straight from the Factory. Real Sticky Situation - A chewed piece of gum is taken from the magician's mouth, he shakes the chewed gum and it turns back into a new, un-wrapped stick of gum. Then the magician shakes the gum a final time to reveal a fully wrapped piece of gum that can be handed out and chewed. Hot Pack - A pack of Wrigley's Juicy Fruit is shown and with the flick of the wrist, the pack turns into a pack of Wrigley's Big Red. Sign Gum Transposition - A spectator and the magician sign separate packs of gum then both hold them tightly in their hands. When both the spectator and magician open their hands they find the signed packs have switched places. Chewing Gum Change - The front and back of an old chewing gum wrapper are shown to a spectator. The wrapper is then folded and un-folded to reveal that is has changed into another type of gum. The magician rubs the gum wrapper and turns it into a new pack of gum which can be handed out. Mercury Gum Box - A spectator's signed, chosen card ends up at the bottom of a gum display pack. A very easy method inspired by John Kennedy. Shrinking Bubble Gum - The magician shows a piece of Wrigley's Hubba Bubba chewing gum, waves a pack of gum over the piece in his hand and opens his hand to reveal a shrunken piece of gum. 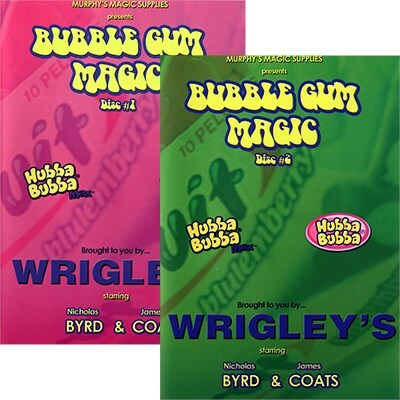 Hubba Bubba Huh - The magician wraps a piece of chewed gum around his finger, shakes his finger and the gum disappears. Another shake of his finger and the gum reappears. Bubble Gum Matrix - Four pieces of gum vanish and reappear at the magician's will during a show of skill and cardmanship. Blow it - A chewed piece of gum is taken from the magician's mouth and put in his hand. The magician opens his hand to reveal that the gum has vanished from his hand and reappeared in his mouth. This trick was inspired by Tom Mullica and his fantastic mouth manipulations. Eclipse - Spectators are asked to remove a few pieces of gum from a pack of Wrigley's Eclipse gum. With a spin of the wrist, the magician makes the gum reappear in the now un-opened pack. Eclipse Card - A spectator's freely selected signed card ends up in a brand new pack of Wrigley's Eclipse chewing gum. A perfect combination of "Eclipse" and card magic. I love organic magic and gum effects are perfect for the genre! Visual goodness!